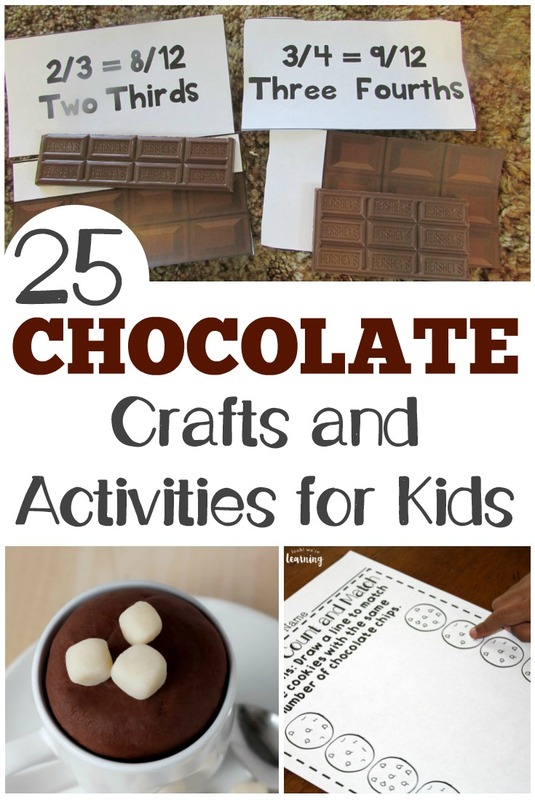 25 Chocolate Craft Ideas and Activities for Kids - Look! We're Learning! Yeah, I’d have to say no. So when it comes to making learning fun, I love the idea of adding chocolate to the mix! I thought these fun chocolate craft ideas and activities for kids would be a neat way to give winter learning a little “sweetness”, so I’ve rounded up 25 different resources below that kids (and their parents) will love! There are chocolate crafts, chocolate sensory play ideas, chocolate-themed printables, and even chocolate science experiments below to explore! Want even more chocolate learning fun? Don’t miss our list of Charlie and the Chocolate Factory craft ideas that go wonderfully with the book or the movie! 1. Pick up some free Chocolate Notebooking Pages for the kids! 2. Combine snacks with science experiments in this fun Hot Chocolate Science activity! 3. This adorable Cookie Jar Number Matching printable is so cute for chocolate chip cookie lovers! 4. The kids will love exploring the touch and smell of this No-Cook Chocolate Playdough! 5. Even toddlers can make art with this easy Edible Chocolate Paint! 6. This Pom-Pom Hot Cocoa Mug Craft is just too adorable! 7. Kids will get a kick out of eating these Snowy Chocolate Pinecone Snacks. They actually look like pinecones! 8. Let the little ones make their own cocoa with this DIY Hot Chocolate Bar! 9. This simple Puffy Paint Chocolate Chip Cookie Craft is a fun art project to try! 10. We’ve made oobleck before, but I’ve got to give this Chocolate Oobleck a try! 11. Get some early math practice with this Hot Chocolate Ten Frame Addition printable! 12. Introduce the kids to engineering with these easy Hot Chocolate Marshmallow Sculptures! 13. Grab these Charlie and the Chocolate Factory Notebooking Printables to complete as you read the book!